Venture capital fund Insignia Ventures Partners has signed an agreement with Topica Founder Institute (TFI) to support start-ups in the country. 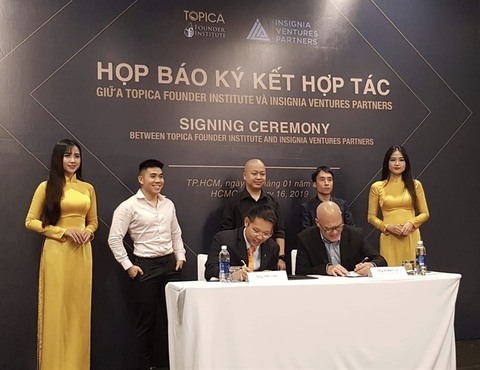 Insignia Ventures Partners signs an agreement with Topica Founder Institute to support start-ups in Viet Nam. It will invest at least US$50,000 in each start-up whose founder graduates from the TFI programme. According to the two sides, this is the first blanket deal anywhere in the world where all graduates receive funding support. Speaking at the signing ceremony in HCM City on Wednesday, Yinglan Tan, managing partner of Insignia, said: “Viet Nam is an energetic and potential start-up market. If proper investment is available, great Viet Nam start-ups can emerge. Tran Manh Cong, co-director of TFI, said: “Being with Vietnamese start-ups from the beginning, TFI deeply understands the opportunities and challenges they may encounter, and we are always there to support them, not only with knowledge of building start-ups but also funding for their early stages. Over more than seven years of accelerating founders and start-ups, TFI has garnered strong interest from global investment funds in its graduates. The partnership with Insignia further enhances its reputation as a start-up accelerator. TFI is a joint venture between Topica Edtech Group and the US-based Founder Institute, whose programme is available in over 150 cities globally.